Will she or won't she? The question's been doggedly following former Secretary of State Hillary Clinton since her 2008 loss in the Democratic primary. On Tuesday, Clinton began her book tour for her recently released Hard Choices; the tour, which is scheduled to stop in 15 cities in the next two months, bears an uncanny resemblance to a Clinton presidential campaign, as many have pointed out. But reporters aren't the only people interpreting the tour as a sure sign of candidacy. Sean Brennan was the first person on line for Clinton's first book-signing Tuesday morning in New York City, and he told Business Insider that he arrived at the venue at 2PM the day before. Brennan was accompanied by a "Ready for Hillary" truck, which was parked right outside the venue. But does Hillary want to run? Yes, her approval ratings have mostly risen since her run in 2008. Yes, her book tour will allow her to gain favor with the American public. Yes, she has the money, the accomplishments, and the team of supporters. But, why risk all that for a president campaign... again? Chelsea Clinton announced in early April that she was pregnant, and Hillary seems incredibly excited about being a grandmother. She's mentioned several times that she wants to spend a lot of time with her grandchild — a task that's probably a little difficult to fit in when you're running a country. Most recently, in an interview with Diane Sawyer, she said, "I don't want to be focused on something two years away. I want to be focused on this baby in front of me." However, like everything else related to running for office, Clinton has said she won't know how she feels until she knows how she feels. It's hard to argue with that. Clinton also told Sawyer that she's grown accustomed to having more freedom in her schedule and that she likes it. We're not surprised she wants to see more of her friends. After all, the woman took a selfie with Meryl Streep. The Clintons were also recently spotted house-shopping in the Hamptons, and frankly crashing at a nice "oceanside mansion" sounds like a good end to a book tour to us. According to a Gallup poll, Clinton's highest approval ratings since 1999 were between 2009 and 2013. Her numbers have dropped slightly in the past year (down to 54 percent from 64 percent in 2013). And, of course, America didn't vote her in last time she ran for president. She's also come a long way finace-wise, from being, quote-unquote "dead broke." Why not take that extra money, retire on a tropical island, and enjoy some Hillaryburgers? In early May, Monica Lewinsky penned a piece for Vanity Fair called "Shame and Survival," in which she discussed her affair with then-President Bill Clinton. Hillary Clinton has said of the piece, "I am not going to comment on what I did or did not say back in the late '90s." Which seems like a hard promise for a presidential candidate to keep. 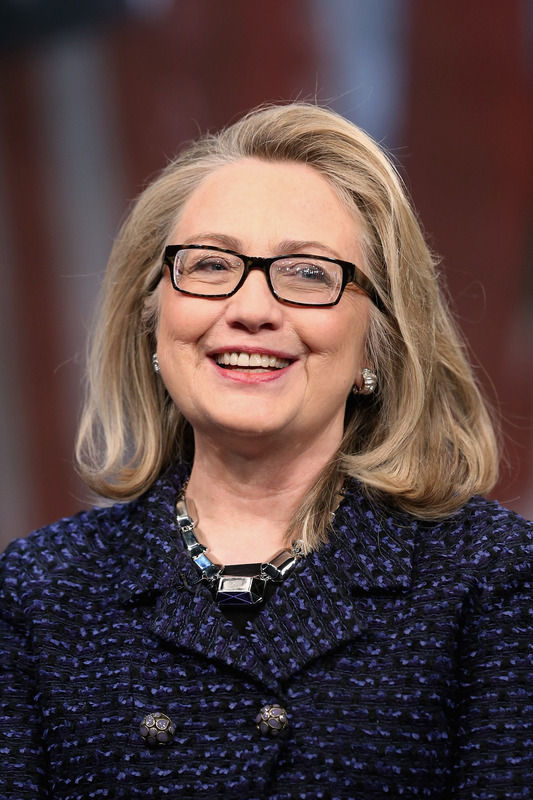 Additionally, Clinton will probably be grilled yet again on her choices regarding the Benghazi attack. The Republican National Committee has already created a memo with talking points against Clinton, entitled "Bad Choices," and more hearings on Benghazi are scheduled to begin soon. Fortunately, despite the daunting task of defending herself against these allegations, Clinton doesn't seem deterred. "It's more of a reason to run," she told Sawyer about the Benghazi hearings. If Clinton were to run, and win, she'd inherit many of the problems that have been plaguing the Obama administration. Clinton would probably have to tangle with a GOP-led Congress, which has been doing all it can to discredit the current President's proposals. I do not believe our great country should be playing minor league ball. We ought to be in the majors. I view this as really apart from — even a diversion from — the hard work that the Congress should be doing about the problems facing our country and the world. But if anyone can fix it, Hillary can.